Blue Forest were commissioned to design an imaginative children’s tree house, an outdoor kitchen and a sunken firepit, to create an idyllic outdoor living space set within the beautiful grounds of our client’s garden. What we created, was something truly magical, that encompasses all aspects of Outdoor Living. The tree house is a wonderful space to enjoy throughout the seasons, opening out onto a large deck you can relax and enjoy the summer months while taking in the magnificent views of the adjoining fields, or you can snuggle up with a good book in front of the log-burning stove and stay snug and cosy during the winter months. The extensive Outdoor Deck, complete with a beautifully crafted outdoor kitchen and sunken firepit is linked to the tree house by a satellite deck and woven rope bridge. This is the perfect spot for Al fresco dining and entertaining guests. The outdoor kitchen forms an organic curved counter, sheltered by a similar cedar shingle roof line to the tree house. The structure opens on to a large decking area, flowing seamlessly to the tree house, the outdoor eating area and the sunken fire pit, creating an idyllic complex of natural structures perfect for relaxing and socialising. 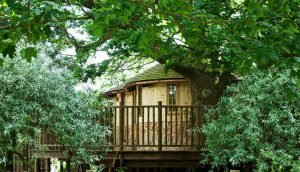 Built round a 300-year-old oak the 15ft long, oval-shaped, treetop dining tree house is reached by a wide spiral staircase that sweeps round the girth of the tree. Adjacent to the family home, this treehouse retreat contains a modern kitchenette in an airy, bright, open plan room. Whether for family gatherings, parties or for kids to play in.